If you are looking for something fun to do with the kids over the holidays, check out New West Theatre’s production of Munsch-o-Ram a, which runs at 1 p.m. at Casa every afternoon until Jan. 5. 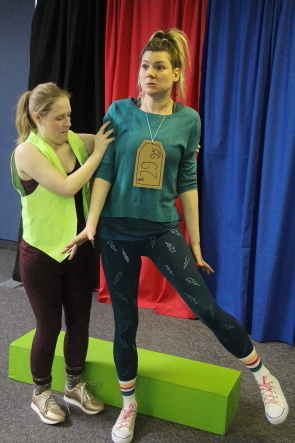 The energetic, colourful and hilarious production features the talented trio Camille Pavlenko, Kelly Malcolm and Ryan Reese racing to break a record by act out five popular Robert Munsch stories in less than an hour in their Munsch Olympics. 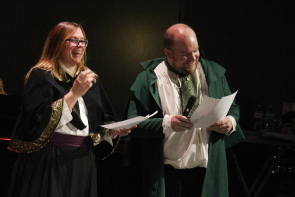 They do a great job and don’t even seem to be out of breath after all the frenetic racing around, multiple accents, costumes, props and comedy they pack into the show. It is geared towards children of course, but adults are sure to crack a smile even at the crowd participation as they tap into their young audience’s enthusiasm. The actors all play multiple characters and each take a turn as narrator in director/playwright Jeremy Mason’s adaptation of the five popular Robert Munsch stories. The colourful stage features a handful of simple set pieces including three boxes, a barrel and a ramp, which play as many roles as the actors do. They start by introducing friends Camille and Ryan and meet Kelly, asking her to join in the Munch Olympics and the proceed to race around and play like big kids. The show has a good, strong start with Something Good which is about the adventures of a kid in a supermarket as Camille’s southern dad, Ryan, gets tired of his daughter putting junk food in their shopping cart and tells her not to move, which she takes literally and comedy ensues as Kelly Malcolm plays an array of characters including a supermarket worker who puts a price tag on her mistaking her for a doll, then a customer who tries to buy her. Camille doesn’t say a world but is provides a lot of laughs with just her facial expressions. New West Theatre always provides lots of laughs and good times with their December greatest hits show and their latest Hit Parade is no exception. As expected, there is lots of “singing and talking” and quite a bit of dancing to some audience favourites from the past years. New West veteran Grahame Renyk returned to direct Hit Parade, and his wit was apparent in some of the beloved comedy bits and characters the troupe brought back. Erica Hunt and Scott Carpenter’s Scottish film critics made fun of that as they reviewed some of this year’s movies about music like Bohemian Rhapsody and A Star is Born. Another bit I enjoyed was the cast’s take on the RCMP Musical Ride, with the cast dressed in red Mountie serge, reenacting some of the moves the musical ride performs on horses. “Seven Little Girls,” was a ’50s pop highlight with all the cast members dressed as girls in love with Rylan Kunkel’s “brother, Fred” played by Greg Paskuski. Rylan Kunkel was a highlight, performing saxophone with the band for several numbers, and dressing as a full flamboyant Elton John at his finest to perform Crocodile Rock on the piano. The Dec. 20 WTF variety at the Slice was well named and not badly attended. I caught the third set of disturbing wackiness from a variety of performers including Harley Page, Fatt Matt and Eden Rodriguez, though I missed the Real Green Fairy. 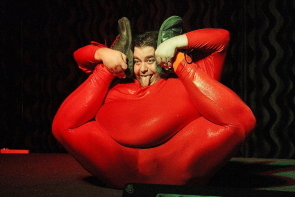 Comedian and contortionist “Fatt” Matt Alaeddine billed himself as the world’s fattest contortionist. He shouted jokes as he performed contortion acts from Japan, France, Germany and America and wound up his set by trapping himself in a reinforced hula hoop, contorted himself, rolled around the stage and possibly dislocated his shoulder to successfully free himself from it. Harley Page returned to seductively move around the stage and into the audience, while pulling a condom through her nose and mouth, then returned to stage to use a staple gun on her bosom and belly. Eden Rodriquez wound up the night by making politically incorrect jokes about Hitler, Jews, his mother and his ex wife. Christmas was everywhere on Friday, Dec. 14. So I hit three Christmas bashes beginning with the Lethbridge Shakespeare Performance Society’s annual Shakespeare Meets Dickens fundraiser. 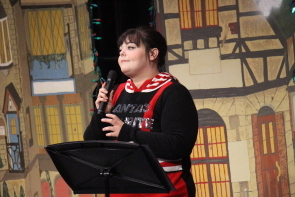 Megan Wittig sang more operatic Christmas songs.